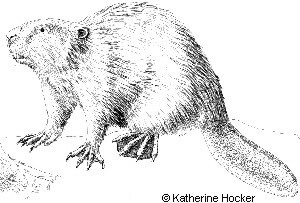 The Beaver (Castor canadensis) is North America's largest rodent. The beaver's scientific name is descriptive of the castor glands which are located near the base of the tail. Castor is a strong-smelling, oily substance that is attractive to many animals. The beaver is found throughout most of the forested portions of the state, including Kodiak Island where it was introduced in 1925. Beavers in the wild live about 10 to 12 years. They have been known to live as long as 19 years in captivity. They continue to grow throughout their lives and may reach 3 to 4 feet (0.9-1.2 m) long, including tail. Although most adult Beavers weigh 40 to 70 pounds (17-32 kg), very old, fat Beavers can weigh as much as 100 pounds (45 kg. The beaver's heavy chestnut brown coat over a warm soft underfur keeps the animal comfortable in all temperatures. Its large, webbed feet and broad, black tail (about 10 inches long and 6 inches wide, or 25 cm long and 15 cm wide) can be used as a rudder when swimming. When slapped against the water, it serves as a sign of warning, but it can signal other emotions as well. When the beaver stands up on its hind legs to cut down a tree, the tail is like a fifth leg used for balance. The beaver is designed to swim and work under water. Its nose and ear valves close when the beaver is submerged. A beaver can cut and chew submerged wood without getting water in its mouth by drawing its loose lips tightly behind the protruding front teeth. In order to survive, beavers must be assured of 2 or 3 feet (0.6-0.9 m) of water year round. Water provides a refuge from enemies. Beavers build canals to float and transport heavy objects such as branches and logs for food and construction. Food for winter use must be stored in underwater food caches. If the habitat does not have the necessary water level, beavers construct dams. Each dam is a little different. A beaver may work alone or with family members to build a dam, using piled logs and trees secured with mud, masses of plants, rocks, and sticks. Although the average tree used for construction of a dam is 4 to 12 inches (10-30 cm) across the stump, use of trees up to 150 feet (45 m) tall and 5 feet (115 cm) across have been recorded. As the tree snaps, the beaver runs! Very large trees are not moved but the bark is stripped off and eaten. Smaller trees are cut into moveable pieces, dragged into the water for repairing dams and lodges. This work is done mainly in autumn. The den is used as a food cache, rearing area, and general home. Dens are of two types depending on water level fluctuations. Bank dens are simply dug into the stream or river bank with a mass of sticks, mud, and rocks constructed over the top of the den. Lodges are constructed of the same materials as bank dens, but are located where the water level is more stable and slower moving, like in a pond or lake. Where streams are too large or swift to dam but do provide ample water throughout the year, the Beavers may use bank dens. These may have several tunnel exits with at least one above the high water mark and another below the low water mark. The den itself is a large chamber averaging 2 feet wide by 3 feet long by 3 feet high (60 x 90 x 90 cm). Bank dens and lodges have two things in common: they have one chamber-like room and at least one tunnel exit to deep water so it will be free of winter ice. The exit provides quick and easy access for food gathering and emergency escape from predators. Each year beavers will add materials to the lodge whether or not repairs are necessary. The same lodge is used by a beaver family year after year, so some can be quite large. It is the family's home year-round. After mating (which takes place in January or February), the female prepares for a new litter. One to six kits are born anytime from late April to June. Their eyes are open at birth, and the kits are covered with soft fur. They can swim immediately. The young beavers live with their parents until they are 2 years old. Then they leave to find their own homes. The life of a beaver colony is governed largely by food supply. Beavers eat not only bark, but also aquatic plants of all kinds, roots, and grasses. As they exhaust the food supply in the area, the beavers must forage farther from their homes. This increases the danger from predators. When an area is cleared of food, the family migrates to a new home. In Alaska, wolves, lynx, bears, and humans are important predators of beavers. As Beavers cut down small trees and clear away brush, they create new habitats that are ideal food patches for other animals. Waterfowl use these areas as feeding and nesting grounds. Ponds created by Beavers often serve as fish habitat. Occasionally Beaver dams may block streams to migrating anadromous fish, like salmon, and at times road culverts may be blocked or other human developments flooded by this industrious animal. In the past, pelts were so important they were used as a trade medium in place of money. Between 1853 and 1877, the Hudson Bay Company sold almost three million Beaver pelts to England. In Alaska today, trappers still harvest these furs. They are highly prized for cold weather coats and hats.